1 By its appeal, the Netherlands Maritime Technology Association seeks to have set aside the judgment of the General Court of the European Union of 9 December 2014 in Netherlands Maritime Technology Association v Commission (T‑140/13, EU:T:2014:1029; ‘the judgment under appeal’), whereby the General Court dismissed the action for the annulment of Commission Decision C(2012) 8252 final of 20 November 2012 relating to State aid SA.34736 (2012/N) — Spain — Early depreciation of certain assets acquired through a financial leasing (‘the contested decision’). ‘2. Where the Commission, after a preliminary examination, finds that the notified measure does not constitute aid, it shall record that finding by way of a decision. 3 The facts which gave rise to the present proceedings are described as follows in the judgment under appeal. 4 The appellant, an association representing the interests of Dutch shipyards, lodged a complaint, together with other associations, against a Spanish tax scheme promoting the construction of vessels in Spanish shipyards (‘the previous early depreciation scheme’). According to the complainants, that scheme made it possible to secure a rebate of 20% to 30% on the construction price of a vessel (‘the rebate’). 6 Initially, the shipping company which wanted to purchase a vessel and to take advantage of the rebate agreed with a shipyard on the ship to be built and on the purchase price, namely the net price. This initial contract provided for the payment of regular instalments. However, in order to qualify for the rebate, the company undertook not to purchase the vessel directly from the shipyard but from an Economic Interest Group (EIG) set up by a bank, which brought together a number of investors. Profits and losses made by the EIG were apportioned among its members on a pro rata basis according to their holdings. 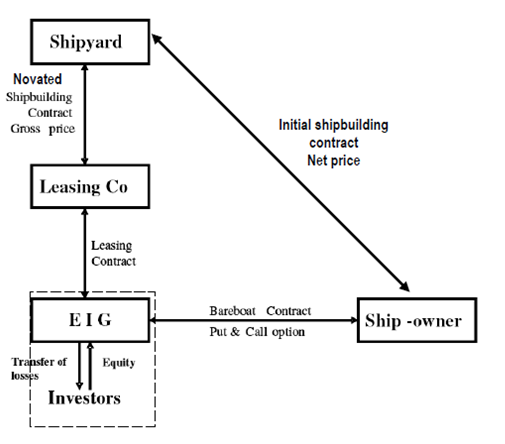 7 Thereafter, the leasing company purchased the vessel from the shipyard, and then leased it to the EIG, which thus enabled its investor members to deduct from their tax bases the instalments paid to the leasing company. As regards those regular payments, the leasing contract provided for one extra instalment over and above those stipulated in the initial contract. The amount of this extra instalment constituted the rebate, which is the difference between the net price set out in the initial contract and the gross price actually paid by the leasing company to the shipyard. 8 At the end of the leasing contract, with a duration of three to four years, the EIG undertook to purchase the vessel from the leasing company. That vessel was then resold to the shipping company at the net price, as initially agreed. 9 According to the Opening Decision, the arrangements described in paragraphs 5 to 8 above sought to secure tax advantages within the EIG, advantages which were then apportioned among the parties concerned. 10 First, according to Spanish accounting rules, costs arising from the use of an asset were not to be influenced by its method of financing. Accordingly, leased assets could be depreciated in the same way as assets which were otherwise financed. Article 115 of the Royal legislative decree 4/2004 approving the coordinated text of the law on corporate taxation (Real Decreto Legislativo 4/2004, por el que se aprueba el texto refundido de la Ley del Impuesto sobre Sociedades) of 5 March 2004 (BOE No 61, of 11 March 2004, p. 10951; ‘the LIS’), dealt with the tax treatment of certain leasing transactions. 11 Article 115(6) of the LIS permitted accelerated depreciation, over three to four years, of payments made under a leasing contract, in order to make it possible to depreciate a vessel for tax purposes faster than its real wear and tear. Furthermore, Article 115(11) of the LIS enabled the depreciation to be brought forward so that it started before the asset became operational, that is as soon as construction began. That possibility of early depreciation, which was available to EIGs under certain conditions pursuant to Article 48(4) of the LIS, was subject to prior authorisation from the Spanish Ministry for Economic Affairs and Finance. The authorisation procedure was governed by Article 49 of Royal legislative decree 1777/2004 approving the regulation on corporate taxation (Real Decreto 1777/2004, por el que se aprueba el Reglamento del Impuesto sobre Sociedades), of 30 July 2004 (BOE No 189 of 6 August 2004, p. 37072; ‘the RIS’). 12 Accelerated and early depreciation increased the costs of the EIG and created losses for it, which the investors could deduct from their tax bases. It also artificially decreased the tax value of the vessel compared to its real value. That capital gain amounted to a hidden liability which, according to the normal rules on corporation tax, was taxable if the vessel was resold. 13 Second, before reselling the vessel to the shipping company pursuant to the bareboat charter contract, the EIG applied for authorisation from the tax authorities to opt out of the normal corporation tax system and opt into the tonnage tax system provided for in Articles 124 and 128 of the LIS, which provided for the taxation of activities related to shipping based on the tonnage of vessels. It replaced normal corporation tax. Article 125(2) of the LIS governed the taxation of capital gains made when a vessel was resold. For that purpose, it provided for the taxation of capital gains made on the sale of vessels which were subject to the tonnage tax system, where those gains were the result of an over-depreciation carried out before those vessels entered that system. 14 However, the effect of Article 50(3) of the RIS was that the ring fence rule laid down in Article 125(2) of the LIS did not apply if the vessel was purchased under a leasing contract approved beforehand by the tax authorities on the basis of Article 115(11) of the LIS. Such a vessel was considered to be new, irrespective of whether it had already been used or whether it had already been depreciated. Switching to the tonnage tax system therefore enabled the EIG to avoid taxation on the capital gain of the over-depreciated vessel. 15 Together, those provisions placed the EIG in a position to, on the one hand, create losses which its member investors could deduct from their tax bases and, on the other, to avoid taxation on the capital gain of the over-depreciated vessel. The combination of these effects made it possible to secure a tax gain corresponding to approximately 30% of the gross price paid by the leasing company to the shipyard. That gain was then apportioned among the investors in the EIG (10% to 15%) and the shipping company (85% to 90%). 16 In the Opening Decision, the Commission considered that the advantages flowing from the previous early depreciation scheme constituted State aid, within the meaning of Article 107(1) TFEU, in favour of all the parties involved in the vessel leasing scheme. The Commission observed that the system was used almost exclusively in transactions involving shipping companies purchasing vessels from Spanish shipyards. According to the Commission, all those transactions also involved leasing companies and wealthy Spanish taxpayers grouped together in EIGs under the aegis of structures put in place by Spanish banks. The Commission considered, inter alia, that the early depreciation scheme provided for in Article 115(11) of the LIS contained an element of selectivity, since it required an authorisation from the tax authority covering all the effects of the leasing contract. The Commission added that it had approved the tonnage tax system in Decision C(2002) 582 final of 27 February 2002. However, the Commission noted that Article 50(3) of the RIS, which enables the effects of the ring fence rule in Article 125(2) of the LIS to be nullified, was not notified to the Commission and, as such, had not been approved by it. 18 In response to the Commission’s requests for information, the Kingdom of Spain provided additional information on 6 June and 22 August 2012. After a meeting between the Commission and the Kingdom of Spain on 4 September 2012, the latter submitted an amended version of the notified measure on 24 September 2012. The Kingdom of Spain also sent to the Commission additional requested information on 26 September and 5 October 2012. 19 During the examination conducted by the Commission, the appellant wrote to the Commission on 6 July, 24 and 27 August and 20 November 2012 requesting information on the progress of the examination of the notified measure and submitting that third parties should be given the opportunity to comment on the notified measure. 20 By the contested decision, the Commission held that the notified measure did not constitute State aid, within the meaning of Article 107(1) TFEU, and was, due to there being no selective advantage, compatible with the internal market. 21 According to the contested decision, the application of the amended Article 115(11) of the LIS is optional and no longer requires prior authorisation. Mere notification to the tax authorities is sufficient. Further, the Spanish authorities confirmed that that provision required no implementing measure, and consequently the conditions for application previously laid down by Article 48(4) of the LIS and Article 49 of the RIS were no longer relevant and would be repealed. According to that decision, the Spanish authorities also confirmed that Article 50(3) of the RIS would be repealed, and consequently the ring fence measure laid down in Article 125(2) of the LIS would henceforth apply to the capital gain realised on the transfer of over-depreciated vessels from the normal tax system to the tonnage tax system. 22 In the contested decision, the Commission analysed whether the notified measure was such as to favour certain undertakings or certain sectors of activity for the purposes of Article 107(1) TFEU. 23 The Commission noted, first, that that measure was applicable to all the companies which are subject to income tax in Spain without distinction according to sectors of activity, places of establishment, size or legal status. The fact that the measure applied only to assets acquired through a leasing contract did not give rise to a selective advantage, as all kinds of assets can be financed through leasing contracts, which can be used by companies of all sizes operating in all sectors of activity. The Commission also noted that, according to the Spanish authorities, the notified measure applied both to assets built in Spain and those built in other Member States. 24 Next, although the notified measure made the possibility of early depreciation subject to several conditions and although it excluded mass-produced assets, the Commission considered that those restrictions were aimed at limiting the possibility of early depreciation to cases where the lessee was required to pre-finance the asset and therefore bear the financial cost of the asset before it became operational. Those restrictions were therefore justified, in the view of the Commission, by reason of the nature and internal logic of the Spanish tax system. 25 Last, the Commission observed that the conditions imposed by the notified measure were sufficiently precise and objective so as to preclude a discretionary or discriminatory application of the measure by the tax authorities. The Commission also held that that application was not subject to prior authorisation from those authorities. 26 Accordingly, the Commission concluded in the contested decision that the notified measure did not constitute State aid within the meaning of Article 107(1) TFEU. 27 By application lodged at the Registry of the General Court on 8 March 2013, the appellant brought an action for annulment of the contested decision. 28 In support of its action, the appellant relied on a single plea in law, alleging infringement of Article 108(3) TFEU and Article 4(2) and (3) of Regulation No 659/1999. 29 The General Court rejected that single plea in law as being unfounded, and consequently dismissed the action. – order the Commission to pay the costs, including those incurred in the proceedings before the General Court. – order the appellant to pay the costs at both first instance and on appeal. 33 In support of its appeal, the appellant relies on three grounds. In those grounds of appeal it is claimed, first, that the General Court did not properly take account of all the arguments relied on by the appellant at first instance; second, that the General Court substituted reasons for those of the Commission and committed a manifest error of assessment, and, third, that the reasons stated in the judgment under appeal are insufficient and contradictory. 34 By its first ground of appeal, the appellant claims that General Court erred in failing properly to take account of all the arguments relied on by the appellant at first instance. 35 In the first part of that ground of appeal, the appellant claims that the General Court misconstrued its argument concerning the fact that the effect of the tax leasing scheme should have been considered as a whole. In that regard, the appellant claims that the General Court should have analysed the amended Article 115(11) of the LIS in the light of certain tax rules currently in force, such as the rules on tonnage taxation and the rules on the fiscal status of EIGs. The appellant considers that its argument that the EIGs continued to benefit from a selective advantage notwithstanding the repeal of Article 50(3) RIS was not examined by the General Court. Consequently, the General Court failed to identify the fact that the analysis made by the Commission in the contested decision was incomplete. 36 In the second part of this ground of appeal, the appellant considers that the General Court misinterpreted its argument that the vagueness of the criteria used in the new tax scheme might lead to the de facto selectivity of the notified measure, thereby conferring on the tax authorities, when conducting a post factum control, a discretion in the use of the tax advantages. The General Court, in paragraph 79 of the judgment under appeal, failed to take account of either the uncertainties caused by such post factum control or the consequences with respect to the selectivity of the tax scheme at issue, but instead held that the appellant was claiming that the notified measure was not directly applicable. 37 In the third part of this ground of appeal, the appellant claims that the General Court erred in failing to state the reasons why it held that it was permissible for the contested decision not to take into consideration the differentiation between the leasing companies and certain investors. The appellant also considers that the General Court did not set out the reasons why such selectivity should be deemed to be inherent in the logic of the new tax scheme. According to the appellant, that new system is selective, since it applies only to leasing companies with sufficiently large resources. If the General Court had properly taken those arguments into consideration, it would have held that the analysis made in the contested decision was incomplete. 38 The Commission argues that this ground of appeal is unfounded. 39 The Kingdom of Spain contends that this ground of appeal is, in part, inadmissible and, in part, unfounded. 40 As regards the first part of the first ground of appeal, it must be pointed out that, in paragraph 79 of the judgment under appeal, the General Court correctly set out that argument, stating, inter alia, that the appellant was arguing that the Commission had not assessed the effect of the notified measure in its context. The appellant is claiming that it is apparent therefore from that paragraph that the Commission had confined itself to studying the effect of that measure in isolation. 41 Further, the General Court investigated, in paragraphs 81 to 83 of the judgment under appeal, whether the Commission had taken account of the combined effect of the previous provisions and other provisions, fiscal and non-fiscal. In that regard, the General Court held that the Commission had examined, in recitals 16 to 23 of the contested decision, the relevance of the previous provisions in relation to the notified measure. In particular, the General Court held, in paragraph 83 of that judgment, that, given that the previous early depreciation scheme provisions were to be repealed and the application of the amended Article 115(11) of the LIS no longer required prior authorisation from the tax authorities, the question of the combined effects of the previous provisions simply no longer arose. 42 The General Court cannot therefore be criticised for having misconstrued arguments raised before it by the appellant that concerned specifically, as is apparent from, inter alia, the application initiating the proceedings, the analysis of the combined effects of the tax measures and other provisions, fiscal and non-fiscal. 43 For the remainder, the General Court did not for all that limit its examination to the previous early depreciation scheme. Thus, in paragraphs 84 to 88 of the judgment under appeal, it set out the appellant’s arguments on the de facto selectivity of the notified measure, to be analysed in the following paragraphs in order to come to the conclusion, in paragraph 92 of that judgment, that, with regard to the new tax scheme, ‘the Commission examined the question of whether the notified measure contained an element of selectivity’. While the General Court considered that examination to have been ‘succinct’, it nonetheless held that examination to have been sufficient, on the conclusion of reasoned argument set out in paragraphs 93 to 101 of that judgment, where the new tax provisions are dealt with. 44 That being the case, the first part of the appellant’s first ground of appeal stems from a misreading of the judgment under appeal and must be rejected. 45 As regards the second part of that ground of appeal, it is clear that the appellant claimed before the General Court that the fact that a measure is directly applicable and leaves no discretion to the authorities responsible for its implementation does not preclude that measure being selective. The appellant argued, in addition, that the amended Article 115(11) of the LIS was not directly applicable, since it contained a number of concepts that were subject to interpretation. 46 In this instance, first, it is clear that that argument of the appellant is clearly stated in paragraph 79 of the judgment under appeal. Second, the General Court replied to that argument in paragraph 82 of that judgment, holding that the Commission had assessed whether the application of the notified measure required prior authorisation or any implementation measures. 47 Accordingly, the second part of the first ground of appeal must be rejected as being unfounded. 48 Last, as regards the third part of this ground of appeal, it is clear that the plea in law relied on by the appellant at first instance was designed to establish that the Commission had not undertaken a complete and sufficient examination of the selectivity of the measure at issue. Suffice it to observe that, in paragraph 91 of the judgment under appeal, the General Court described the examination carried out by the Commission in order to determine whether the amended Article 115(11) of the LIS contained an element of selectivity. The General Court concluded, in paragraph 92 of that judgment, that the Commission had indeed ‘examined the question of whether the notified measure contained an element of selectivity’. Further, in paragraphs 93 to 101 of that judgment, the General Court set out the reasons why it held that examination to be sufficient. Accordingly, the General Court cannot be criticised of having failed to state the reasons why it held that the examination undertaken by the Commission was sufficient. 49 Further, as regards the argument concerning the selectivity of the measure at issue with respect to certain kinds of undertakings, suffice it to observe that the General Court, in paragraph 95 of the judgment under appeal, considered that the Commission was not required to make such an assessment, since the benefit of the early depreciation provided for in the amended Article 115(11) of the LIS is open to any kind of undertaking. 50 It must also be stated, with respect to, in particular, the argument that the General Court failed to take into consideration the differentiation between leasing companies and certain investors, that the reasoning followed by the General Court, in paragraphs 91 to 101 of the judgment under appeal, necessarily implies the rejection of the arguments put forward by the appellant. Since the General Court is not required to reply exhaustively to each of the arguments put forward before it by the parties, it cannot be criticised of not having stated reasons for its findings (see, to that effect, the judgment in Gogos v Commission, C‑583/08 P, EU:C:2010:287, paragraph 30 and the case-law cited). 51 Consequently, the third part of the first ground of appeal must also be rejected. 52 It follows from all the foregoing that the first ground of appeal must be rejected as being unfounded. 53 In its second ground of appeal, the appellant claims that the General Court, by substituting its own reasoning for that of the Commission in the contested decision, committed a manifest error of assessment. 54 First, the appellant considers that the General Court, by holding, in paragraph 97 of the judgment under appeal, that the leasing companies, the EIGs, the investors and the banks could not benefit from the notified measure although there was no basis for such an assertion in either the contested decision or in the file, misconstrued that decision and therefore was led to commit a manifest error of assessment. 55 Secondly, the appellant argues that, in paragraph 97 of that judgment, the General Court failed to determine whether the Commission had sufficiently examined, in the contested decision, the de facto selectivity conferred by the amended Article 115(11) of the LIS, which led the General Court to hold, wrongly, that that decision had been adopted after a full examination. Yet the appellant had identified, in the application initiating the proceedings, the potential beneficiaries of the new early depreciation scheme and had thereby placed the General Court in a position to assess the selectivity of the measure. 56 The Commission and the Kingdom of Spain contend that this ground of appeal is unfounded. 57 As regards the first argument, it must be recalled that, in accordance with the Court’s settled case-law, in proceedings for annulment, the General Court cannot substitute its own reasoning for that of the author of the contested act (see judgments in DIR International Film and Others v Commission, C‑164/98 P, EU:C:2000:48, paragraph 38, and British Aggregates v Commission, C‑487/06 P, EU:C:2008:757, paragraph 141). 58 In this case, the General Court held, in paragraph 97 of the judgment under appeal, that those who are likely to benefit from the notified measure are the lessees, that is, the undertakings who pay the regular instalments required by that type of contract. The General Court observed, however, that since that measure was in principle applicable, as the Commission held in recitals 28 to 32 of the contested decision, to any undertaking of any size, active in any sector of the economy, there was therefore no need for the Commission’s examination to concern the leasing companies or the undertakings that the appellant classifies as ‘intermediaries’. Accordingly, it must be held that the General Court did not substitute its reasoning for that of the Commission with respect to the beneficiaries of that measure. 59 As regards the second argument, it must be observed that that argument was properly presented in paragraphs 84 to 87 of the judgment under appeal and that the General Court replied to it in paragraphs 91 and 92 of that judgment, holding that the amended Article 115(11) of the LIS applied to a category of assets that was open and indeterminate. In particular, the General Court set out, in paragraph 91 of that judgment, the reasons that led the Commission to hold that that provision was a general measure that did not confer a selective advantage on its beneficiaries. 60 Further, the obligation to state reasons does not require the General Court to provide an account which follows exhaustively and one by one all the arguments put forward by the parties to the case, and the reasoning may therefore be implicit on condition that it enables the persons concerned to know why the General Court has not upheld their arguments and provides the Court of Justice with sufficient material for it to exercise its power of review (see judgment in FIAMM and Others v Council and Commission, C‑120/06 P and C‑121/06 P, EU:C:2008:476, paragraph 96 and the case-law cited). 61 Accordingly, the second ground of appeal must be rejected in its entirety as being unfounded. 62 In its third ground of appeal, which has four parts, the appellant argues that the reasons stated in paragraphs 95, 97, 99, 100 and 107 to 111 of the judgment under appeal are insufficient or contradictory. 63 By the first part of this ground of appeal, the appellant argues that the reasons stated in paragraph 95 of the judgment under appeal are insufficient, in that the General Court inferred, from the supposed failure to challenge the status of the EIGs in the Opening Decision, that the Commission was under no obligation to determine whether the notified measure conferred a selective advantage on those entities and their investors. According to the appellant, the Commission should have examined whether any selective advantage was given to the investors grouped in EIGs who might thus acquire the right to early depreciation without becoming lessees. 64 The appellant adds that the contention that the status of EIGs was not challenged in the Opening Decision in the context of the previous early depreciation scheme is not correct. Since it was stated, in the Opening Decision, that the application of that previous scheme might confer a selective advantage on the EIGs, the Commission should, in the contested decision, have assessed whether, following the legislative amendments, the new scheme produced any selective advantage. The appellant claims that the judgment under appeal failed to provide a sufficient and clear statement of the reasons why, despite that omission, that decision was to be deemed to be complete. 65 By the second part of that ground of appeal, the appellant criticises the General Court’s failure to state sufficient reasons, in paragraph 100 of the judgment under appeal, for the assertion that there was no need for the Commission to define a reference framework in order to analyse the effect of the notified measure. In that regard, the reasoning in paragraphs 98 to 100 of that judgment, relating to tax measures which have the effect of creating an advantage for a category of specific undertaking, is flawed. Thus, the General Court should have considered the possibility of de facto selectivity of that measure, given that that measure can be applied not to all types of assets, but solely to the assets defined in the LIS and solely to taxpayers who are active in very specific industries. 66 By the third part of the third ground of appeal, the appellant claims that, although the General Court recognises in the judgment under appeal that there are four criteria defining eligibility for accelerated depreciation, the General Court examined only two, namely the criteria relating to production time exceeding 12 months and the requirement that the fees should largely be settled before completion of the construction of the asset. The appellant thus complains that the General Court failed to examine the effect of the criterion of custom-made design and the exclusion of assets that were mass-produced. In so doing, the General Court ignored the arguments advanced by the appellant at first instance that very few products satisfied the four criteria. Consequently, ‘by failing to examine whether the analysis in the contested decision was sufficient and complete with respect to all the criteria for defining assets eligible for the benefit of early depreciation’, the General Court erred in law. In particular, the General Court was in breach of the principle that the Commission must, if it considers that a measure is justified by the nature and internal structure of the system, thoroughly substantiate that conclusion. 67 By the fourth part of the third ground of appeal, the appellant argues that, in paragraph 109 of the judgment under appeal, the General Court misinterpreted the test for the justification of ‘the differential nature of the tax measures’, as defined in the Commission Notice on the application of the State aid rules to measures relating to direct business taxation (OJ 1998 C 384, p. 3; ‘the notice’). In that regard, the General Court held that differentiation in the tax system is allowed, provided that it is supported by a rational justification, whereas paragraph 23 of that notice states that such a differentiation is allowed if the ‘economic rationale [of the measures] makes them necessary to the functioning and effectiveness of the tax system’. 68 The Commission and the Kingdom of Spain contend that the third ground of appeal is unfounded. 69 It is clear that, by the third ground of appeal, the appellant is not arguing that the reasons stated in the judgment under appeal are insufficient, but is criticising the reasons stated by General Court as being, in its opinion, flawed in several respects. 70 As regards the first part of the third ground of appeal, the appellant disputes the statement made by the General Court, in paragraph 95 of the judgment under appeal, that ‘the status of the EIGs was not challenged by the Opening Decision’, principally on the ground that that statement is of no relevance in so far as it relates to the previous early depreciation scheme, which is not the subject matter of the contested decision, and, alternatively, that the statement is not correct. 72 Further, the General Court stated, in paragraph 95 of that judgment, that ‘the benefit of the early depreciation provided for by the notified measure is available to any kind of undertaking’. 73 It is apparent from reading paragraphs 93 and 95 of the judgment under appeal together, first, that those reasons are sufficient to justify, in law, rejection of the appellant’s argument that an insufficient examination was made, in the contested decision, of the situation of the EIGs. It follows, secondly, that the statement that ‘the status of the EIGs was not challenged by the Opening Decision’, made in paragraph 95 of the judgment under appeal, was made for the sake of completeness. 74 Consequently, the first part of the third ground of appeal, in that it is directed against a reason stated for the sake of completeness, must be rejected as being ineffective. 75 By the second part of this ground of appeal, the appellant disputes the validity of the reasoning in paragraph 100 of the judgment under appeal, which, in its opinion, is flawed. The appellant claims that the tax scheme at issue confers, de facto, a selective advantage on a limited number of undertakings. Consequently, the General Court should have examined the possibility of de facto selectivity. 76 However, it is clear that the General Court stated, in paragraph 98 of the judgment under appeal, that ‘the notified measure is a general tax measure’. The General Court set out, in paragraphs 90 and 99 of that judgment, the relevant principles stemming from the case-law, which principles have not been challenged by the appellant in its appeal. The General Court, in paragraph 91 of that judgment, rejected the appellant’s arguments as to the insufficiency of the examination by the Commission of the selectivity of the national measure at issue. That being the case, the General Court was entitled to take the view, in paragraph 100 of the judgment under appeal, that the criteria of the previously cited case-law did not apply to the notified measure as regards whether it should be defined as conferring a selective advantage, and that ‘there was no need for the Commission to define a reference framework in order to analyse the effect of the notified measure’. 77 Accordingly, the second part of the third ground of appeal is unfounded. 78 As regards the third part of that ground of appeal, directed against paragraphs 107 and 111 of the judgment under appeal, the appellant claims, in essence, that General Court failed to assess whether the Commission had examined the selectivity of the notified measure with all due diligence. 79 It must be borne in mind that, according to settled case-law, the concept of ‘State aid’ does not refer to State measures which differentiate between undertakings and which are, therefore, prima facie selective where that differentiation arises from the nature or the overall structure of the system of which they are part (judgments in Commission and Spain v Government of Gibraltar and United Kingdom, C‑106/09 P and C‑107/09 P, EU:C:2011:732, paragraph 145 and the case-law cited, and BNP Paribas and BNL v Commission, C‑452/10 P, EU:C:2012:366, paragraph 101). In carrying out the necessary comprehensive review of the characterisation of the tax scheme at issue as State aid, the General Court had to examine whether the differentiation between undertakings arising from that scheme was due to the nature or general scheme of the tax system of which it formed part (judgment in BNP Paribas and BNL v Commission, C‑452/10 P, EU:C:2012:366, paragraph 102). 80 In this case, it is apparent from paragraphs 102 to 105 of the judgment under appeal that the appellant disputed the finding, in paragraphs 31 and 32 of the contested decision, that any selectivity of the notified measure is inherent in the general tax scheme and justified by the logic of that scheme. The appellant considered that that analysis was contrary, on the one hand, to the Commission’s previous decision-making practice and, on the other, to the notice. ‘107 It must be observed that, according to paragraph 31 of the contested decision, the conditions imposed by the notified measure restrict the possibility of early depreciation to certain assets. The Commission considered, however, that those restrictions were justified by factors relating to the period of construction of a custom-built asset and the need to meet pre-financing costs during that period. 109 Contrary to what is claimed by [the appellant], the principles established by the Commission in paragraph 23 of [the notice] do not preclude that explanation. On the contrary, that notice allows differentiation within a tax system, provided that it is supported by a rational justification. 110 Further, the Commission was not obliged to follow the analytical approaches which it had used in its decisions on depreciation in Germany and on depreciation in Spain of financial goodwill, referred to above in paragraphs 103 and 105 respectively [of the judgment under appeal], contrary to what is argued by [the appellant]. Each case must be assessed separately according to the particular circumstances of the case (judgment of 1 July 2009 in KG Holding and Others v Commission, T‑81/07 to T‑83/07, ECR, EU:T:2009:237, paragraph 201). 82 It is apparent from those reasons that, having set out the arguments made by the appellant, the General Court rejected them following an overall assessment in paragraphs 107 to 109 of the judgment under appeal. Moreover, in paragraphs 110 and 111 of that judgment, the General Court responded specifically to the appellant’s arguments concerning the Commission’s previous decision-making practice and the significance of leasing contracts for the analysis of the notified measure. Accordingly, the General Court justified its conclusion to the requisite legal standard, and it cannot be held that the General Court was obliged to extend its assessment of the selectivity of the notified measure by adding an exhaustive examination of each of the criteria governing eligibility for that measure. 83 The General Court did not therefore err in law in the exercise of its review of whether the differentiation between undertakings caused by the scheme at issue was not caused by the nature or structure of the tax system of which it formed part. 84 Accordingly, the third part of the third ground of appeal is unfounded. 85 As regards the fourth part of that ground of appeal, the appellant complains that the General Court contradicted the notice, since the General Court held, in paragraph 109 of the judgment under appeal, that that notice allows differentiation within a tax system, provided that that differentiation is supported by a rational justification. 86 In that regard, it must be observed that paragraph 23 of the notice states that ‘The differential nature of some measures does not necessarily mean that they must be considered to be State aid. This is the case with measures whose economic rationale makes them necessary to the functioning and effectiveness of the tax system. However, it is up to the Member State to provide such justification’. It is clear, on the one hand, that the General Court set out, in paragraph 103 of the judgment under appeal, the wording of that paragraph 23 and, on the other, that the expression ‘rational justification’ used in paragraph 109 of that judgment, corresponds, in essence, to the criterion stated in paragraph 23 of the notice. 87 Consequently, the fourth part of the third ground of appeal must be rejected as being unfounded, and the third ground of appeal must be rejected in its entirety as being, in part, inadmissible and, in part, unfounded. 88 In the light of all the foregoing, the appeal must be dismissed in its entirety. 89 In accordance with the first paragraph of Article 184(2) of the Rules of Procedure of the Court of Justice, where the appeal is unfounded, the Court shall make a decision as to costs. 90 Under Article 138(1) of those rules, which applies to the procedure on appeal by virtue of Article 184(1) of those rules, the unsuccessful party must be ordered to pay the costs if they have been applied for in the successful party’s pleadings. 91 Since the Commission has applied for costs against the Netherlands Maritime Technology Association and the latter has been unsuccessful in all its grounds of appeal, the Netherlands Maritime Technology Association must be ordered to bear its own costs and to pay those incurred by the Commission in these proceedings. 92 Under Article 140(1) of the Rules of Procedure of the Court, which applies to the procedure on appeal by virtue of Article 184(1) of those rules, the Kingdom of Spain, which has intervened in the proceedings, shall bear its own costs.